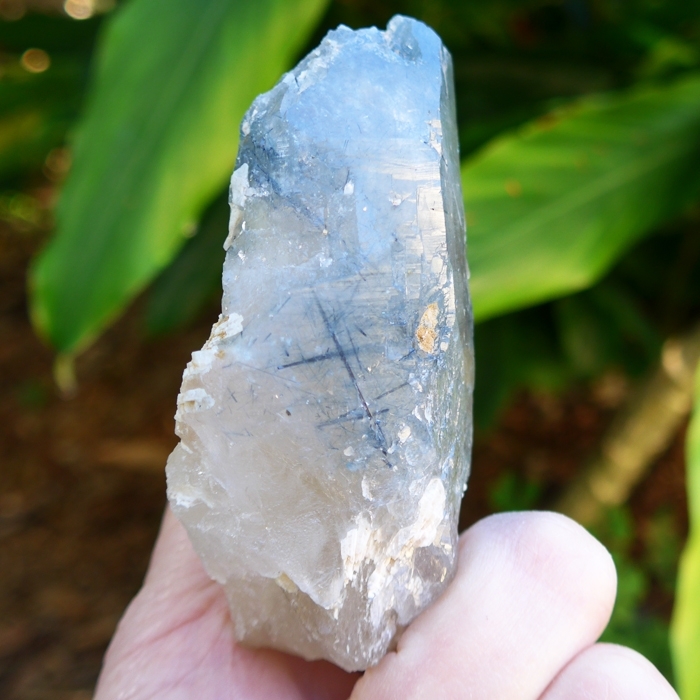 Dimensions (HxWxD): 3.5" x 1.75" x 1"
This stunning 3.5 inch long, natural, untreated, unpolished Indicalite Wand on Matrix comes from Bahia, Brazil and weighs 160 grams. 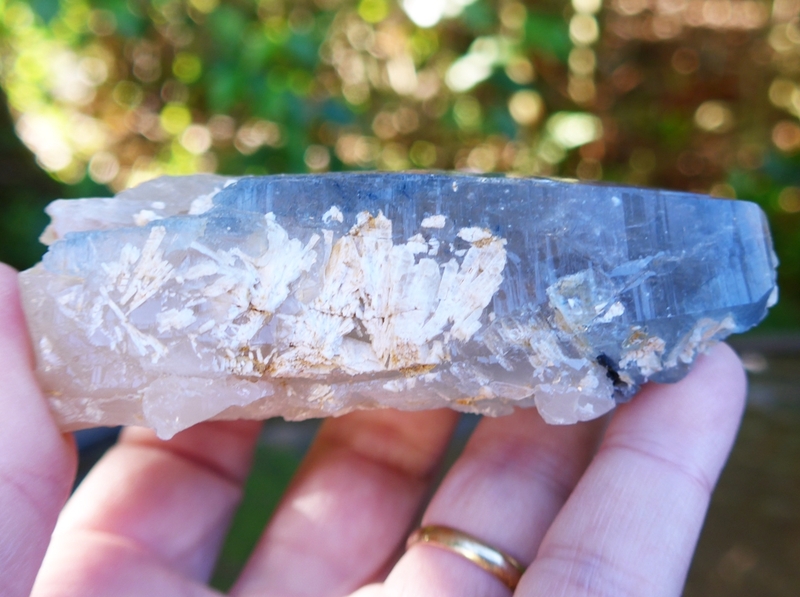 This gorgeous rare specimen is the perfect size to hold in your hand or place in your altar. 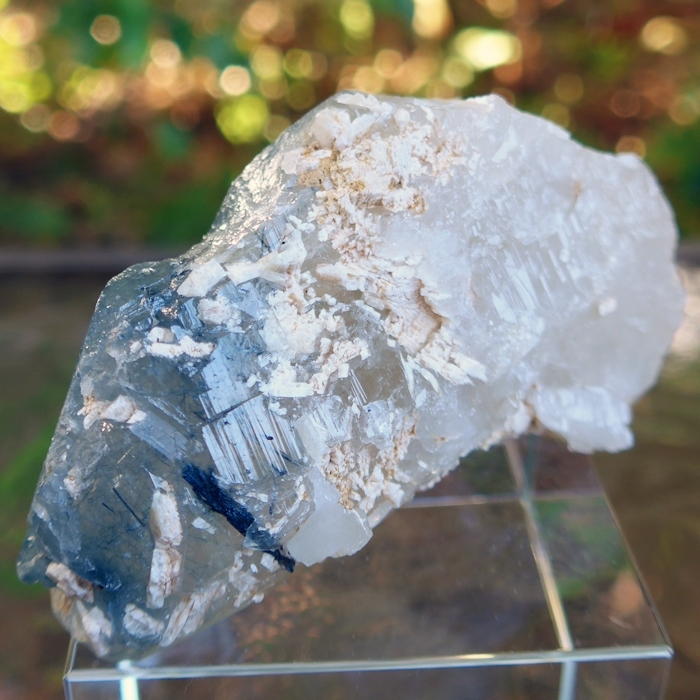 Blue Tourmaline in quartz, also known as Indicalite is a rare crystal formation -- both a mineralogical collector's item and a Lightworker's power tool with a unique and powerful energy signature ideal for meditation or crystal healing. We call crystals with blue tourmaline inclusions Indigo Quartz. In meditation, Jane and I find that the combination of blue tourmaline generates a feeling of protection -- a palpable sense of a powerful cocoon of energy that functions as a "safe room" secure from all impinging energies and intrusive thoughtforms. In addition this combination of stones quiets the mind and enhances the ability to connect to sources of Higher Wisdom. Rare blue tourmalinated quartz, known as indicolite, contains long, thin prismatic crystalline formations of deep blue tourmaline. Indicolite, or blue tourmaline, is an extremely hard complex silicate of boron and aluminum, with powerful piezoelectric properties.This means that indicolite crystals generate electricity when subjected to mechanical stress and pressure. Deep blue tourmaline facilitates the individual’s connection to higher spiritual realms by stimulating Unity consciousness, and awakens the intuitive faculties, providing a more conscious connection to the wisdom of the Higher Self. Indigo Quartz attunes the bearer to the web of life connecting all of humanity, and provides a safe and secure energetic space within which the bearer can feel secure enough to open the heart fully. Indigo Quartz helps to release the fear associated with reaching out to people who are outside our own tribe, religion, class, nationality and racial or ethnic background. Crystal healers use deep blue tourmaline to activate the throat and third eye charkas, strengthening the individual’s ability to apprehend and communicate psychic and spiritual insights. Shamanic practitioners have used tourmaline for millennia to establish contact with spiritual worlds and communicate with ancestral spirits for purposes of divination, guidance and healing. Deep blue tourmaline also strengthens, stimulates and harmonizes the individual’s etheric, astral and causal bodies, providing for deep healing of long-held emotional and mental blockages. Deep blue tourmaline facilitates the individual’s harmonious interaction with all the elements of the environment, including people, animals and objects. Indicolite soothes the soul, calms the mind, and relaxes the body. Lightworkers will find that indicolite facilitates the opening of the heart, and deepens feelings of empathy and compassion while providing a tangible, powerful field of energetic protection to the bearer. This protective energy field is typical of tourmaline, which has been used by many different kinds of healers, from ancient shamans to present day practitioners. Lightworkers will also find that Indigo Quartz facilitates progress along the path of selfless service, enabling the bearer to give in to love and give up all mental considerations and emotional hang-ups serving as barriers along the way. Indicolite is used by crystal healers to treat ailments of lungs, throat, larynx, thymus, thyroid, eyes and brain. 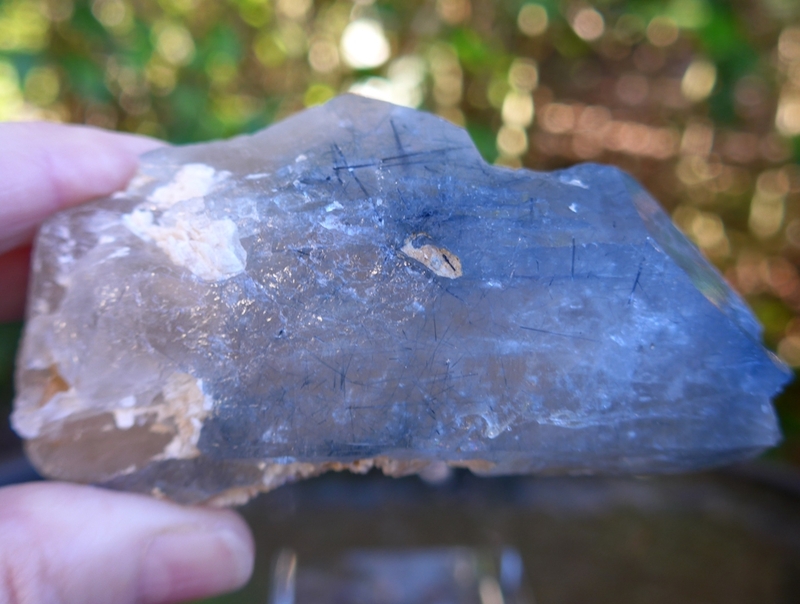 Jane and I are impressed by the powerful healing energy generated by this rare Brazilian deep blue indicolite. 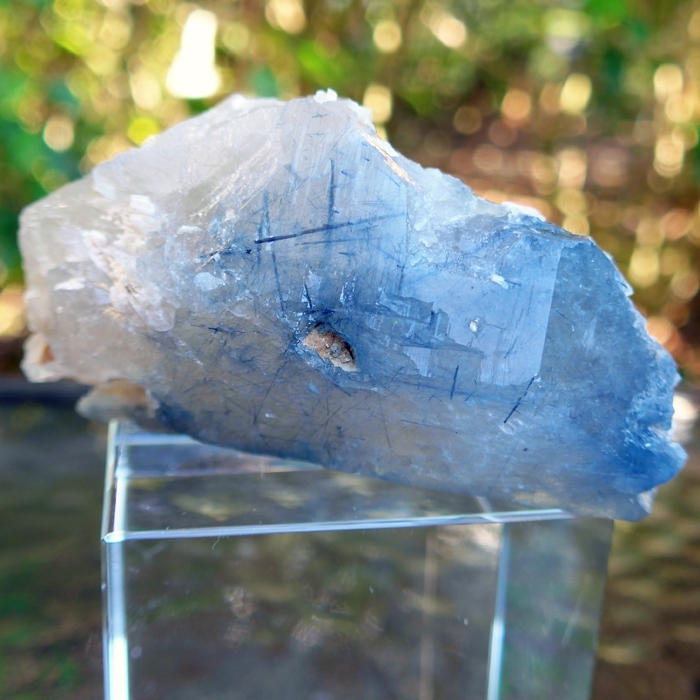 Simply hold this deep blue quartz in your hand during meditation, and feel the flow of peace and stillness spread throughout your aura, facilitating the cessation of mental chatter and the complete relaxation of the body. Or use this powerful golden hued blue crystal as a tool to radiate peaceful, healing energy throughout your environment. Tourmaline possesses the property of omni-directional energetic radiation, so there is no need to consciously direct the flow of energy in any particular direction. Jane and I have also used deep blue tourmalinated citrine in Reiki sessions and found that it imparts a feeling of profound protection, deep relaxation and reverential quietude to clients seeking healing. 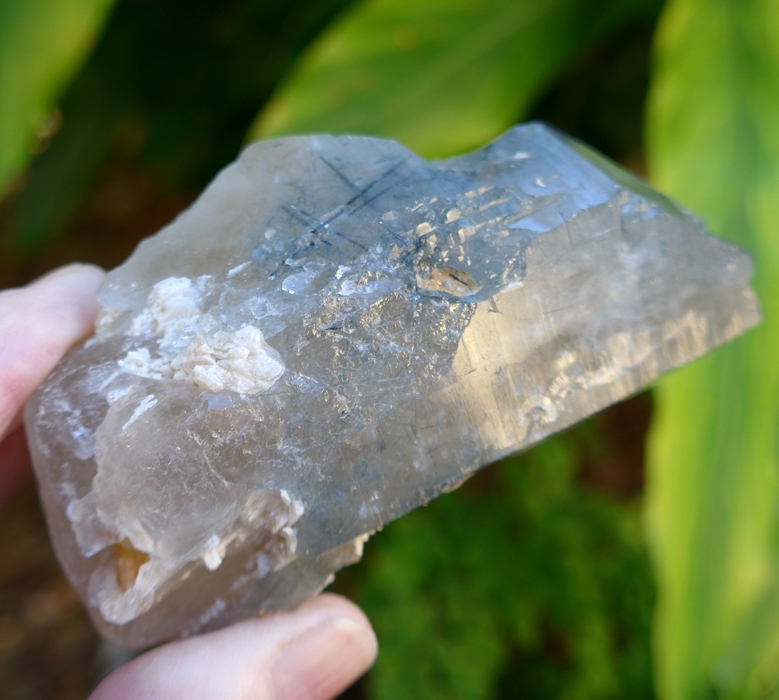 As with all of our crystals and jewelry at SatyaCenter, these are first cleaned and cleared with Reiki energy, color and prayer, and then given a Reiki attunement. Note: Weight above is shipping weight. Net weight is 160 grams.